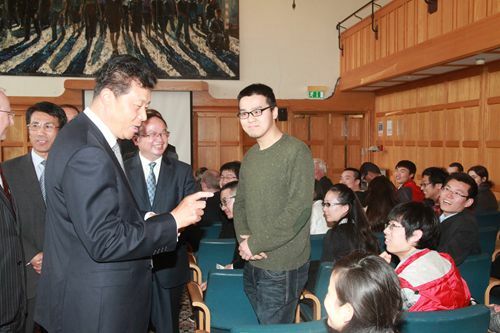 On the spring morning of 20 May, Chinese Ambassador Liu Xiaoming walked onto the campus of Queen’s University Belfast in Northern Ireland. As one of the ten famous universities with the longest history in the UK, it receives numerous political VIPs and celebrities each year. However, Ambassador Liu’s visit today aroused special attention and expectations from its teachers, faculty members and students. The reason for this is because they knew that Ambassador Liu would deliver a speech on China-UK relations, a topic which people have been very interested in recently. 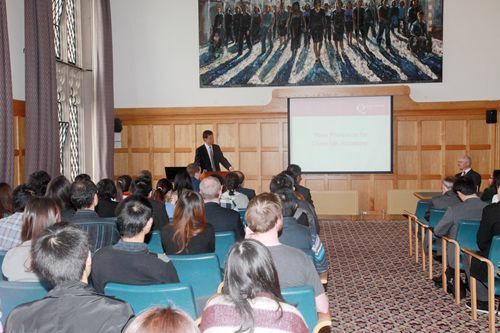 It would be the first speech ever made by a Chinese ambassador at Queen’s University Belfast. Before 11:00am, more than 200 faculty members and students gathered at university’s board meeting hall in an ancient and elegant Victorian building. At 11:00am, Ambassador Liu entered the meeting hall accompanied by Professor Sean Gorman, President’s envoy on China affairs and Dean of the Faculty of Medicine, Health and Life Sciences and was welcomed with a warm round of applause by the audience. 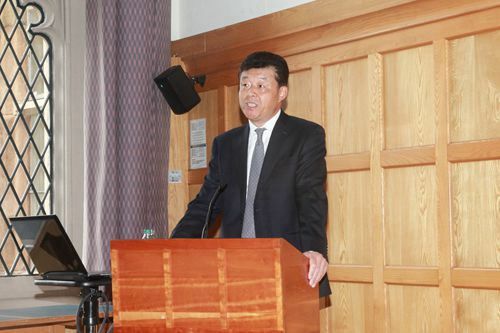 Ambassador Liu came to the podium to deliver his speech after Professor Gorman’s brief introduction. 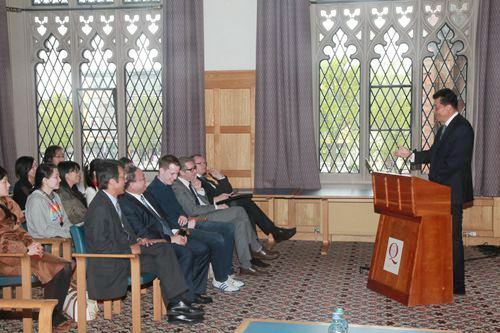 The Ambassador first briefly reviewed his visit to the Queen’s University during the previous year and then introduced the theme of his speech. He said, late last year, he was invited to speak with a group of British young people at Oxford University. During that speech, he reviewed China-Britain relations over the past nearly two centuries, noting that all the historic milestones illustrate one theme, “History Tells”. Today, instead of analyzing the past, he wants to look ahead into the future of China and UK to establish a new type of relations between two big countries. It is also his “dream for China-UK relations”. 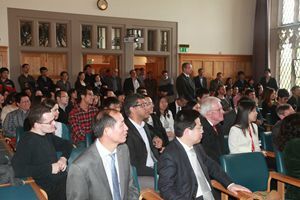 The audience was deeply attracted by Ambassador Liu’s opening remarks of his “dream”. They all listened carefully, waiting for Ambassador Liu to continue with his remarks. 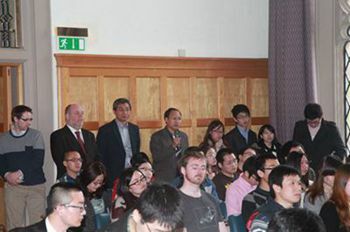 Then, Ambassador Liu explained the connotation of a new type of relations between big countries of China and the UK. He started with Queen’s University Belfast’s coat of arms which features a crown surrounded by four symbols (a harp, a red hand, a sea horse and a book) that represent Ireland, Northern Ireland, Belfast and the University. Likewise, he believes there are four fundamental aspects for the new type of China-UK relations we aim for, namely, understanding, mutual trust, dialogue and cooperation. Ambassador Liu emphasised that understanding is to strengthen mutual understanding and respect, because our two countries are so different in history, culture, development stages and social systems. We must approach these differences with a reasonable mindset. For example, if we always consider ourselves in the right and others in the wrong, then these differences will keep us apart. But, if we can deal with these differences with openness and inclusiveness, if we can understand and respect each other, then despite these differences we can still establish a deeper mutual trust. To this end, China and Britain should share these values, fully understand each other's history and culture, view each other's national realities and political system in an objective light, and respect each other's independent choice of development path. Based on it, the two countries should also build mutual trust. Our mutual trust should be reflected in 'befriendment'. This means we should see each other as partners and friends, rather than opponents and enemies. Second, China-Britain’s mutual trust should also be embodied in 'doubtlessness'. This means the behavior of both sides should be predictable and reliable, and we should accommodate each other’s major concerns. Ambassador Liu said dialogue is a spirit that our relations must always follow. By enumerating the economic and financial dialogue, the high-level people-to-people exchange mechanism, the strategic dialogue and the human rights dialogue, he illustrated the important role played by dialogue in promoting people-to-people exchange and enhancing mutual friendship. Then, Ambassador Liu pointed out that cooperation is the most tangible and strongest bond in state-to-state relations. To establish the new type of relationship, cooperation between China and Britain should be all-directional, including both bilateral and multilateral cooperation. The goal and result of cooperation should be mutual benefits. Ambassador further pointed out that the above four elements of understanding, mutual trust, dialogue and cooperation are mutually inclusive, while at the same time, each have their own focus. Understanding is the foundation, mutual trust is the key, dialogue is the means and cooperation is the goal. Only with mutual understating, can we enhance mutual trust. Only with mutual trust, can we intensify dialogue. Only through dialogue can we have fruitful cooperation. Finally, Ambassador Liu said that from some reading he did about the university, he found that the Mountaineering Club produced three Everest summiteers. This is an exceptional accomplishment. Inspired by their extraordinary feat, he believes as long as we have firm conviction and make relentless efforts, we will conquer the summit of understanding. In turn, with mutual understanding, we will be able to enhance mutual trust, deepen dialogue and expand cooperation. Then the new type of China-Britain relationship will come true. He was sure that this new type of relationship will bring greater benefits to both countries and to the world. Ambassador Liu’s splendid speech won a warm and lasting round of applause from the audience. His idea that China and the UK should establish a new type of relations between big countries aroused strong interests. 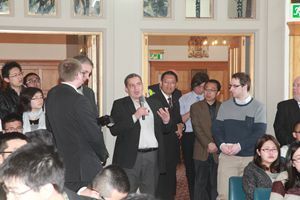 The teachers and students at the scene raised questions on China-UK relations and the exchange between China and the West from different perspectives. Ambassador Liu answered these questions one by one, and took the opportunity to introduce the development of China and China-UK relations, encouraging each one present to learn more about modern China and promote the exchanges and cooperation between China and Britain. President of the Student Union and Member of the School Board, O’ Neil, said British students are very interested in China and wish to know whether there are any practical approaches to deepen their understanding about China. Ambassador Liu said that the students first have to go to China. If it is possible, take a tour and see China with your own eyes. Second, they may read more articles and information relevant to China. Third, they may make friends with Chinese overseas students and learn a lot of information about China from them, including their hometowns and their daily lives. In addition, it is also very important to study Chinese. The Chinese language is a key to open the door of China. Ambassador Liu taught O’ Neil how to say, “你好”, a daily expression in Chinese meaning “hello”. O’ Neil repeated the word in real earnest and was praised by Ambassador Liu as well as received warm applause from the audience. Another student said some media hold that China-UK relations lag behind China’s relations with Germany and other EU states, so what actions will China and Britain take to improve their relations? Ambassador Liu said, in spite of recent frustrations in political relations, the two countries are still keeping strong and close cooperation relations in sectors such as economy, trade, finance and education etc. For example, the bilateral trade volume last year rose by 7.5% over the previous year, and Britain is the only country among EU states that enjoys growth in both imports from and exports to China. More than half of Chinese students studying in Europe are studying in Britain. We hope that Britain may respect China’s core interests and major concerns and work together with China to turn the bilateral relations to a new page as quickly as possible and once again make China-UK relations one of the best relations between China and EU states. A student from Tianjin, China said he could not agree more with Ambassador Liu’s view that countries need mutual understanding. But how can we enhance the mutual understanding between China and Britain in a practical way? Ambassador Liu said there are a variety of channels to deepen mutual understanding between the two countries. For example, there are a lot of Chinese students studying in Britain. They should actively introduce to all circles in Britain China’s history, culture, reform and opening up, telling their British teachers and fellow students the stories about their hometowns and try to serve as envoys of friendship and communication. There are now 24 Confucius Institutes and more than 70 Confucius Classrooms in Britain. They should play an important role in introducing the Chinese language and Chinese culture. The two countries should also arrange more exchanges and summer camps for university and high school students. China also actively supports the cooperation between the two countries in tourism. We welcome and encourage the two peoples to visit each other’s country. 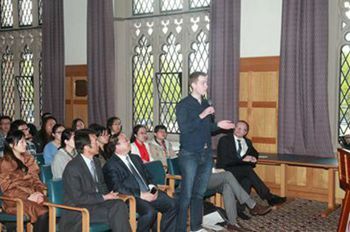 A British student was interested in museum exhibitions, cultural performances and other people-to-people exchanges between China and Britain. Ambassador Liu said that China and Britain have established sound cooperation in museum exhibitions and cultural performances. In recent years, the British Museum, The Victoria and Albert Museum have organised a series of exhibitions introducing different aspects of China. The Palace Museum and many local museums in China have also offered exhibitions of Chinese collections in London, Cambridge and Wales. Chinese versions of British musicals Cats and Mama Mia were also staged in China. In August of this year, the Shanghai Ballet Company will visit Britain and will present the British audience with an elaborately made ballet Jane Eyre, a famous British literary work. He hoped that China and Britain may arrange more exciting exhibitions and performances in the future which will serve as bridges for mutual understanding and friendship between the two peoples. 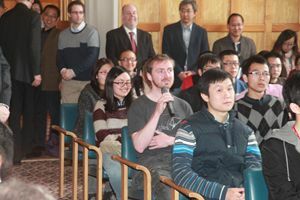 Ambassador Liu also answered students’ questions on China-EU relations, UK-EU relations, the Middle East situation, China-Egypt relations and other issues. Soon it was time to conclude the event, but the audience still seemed to have a lot of questions to ask. The spring weather in May is very nice in Northern Ireland. 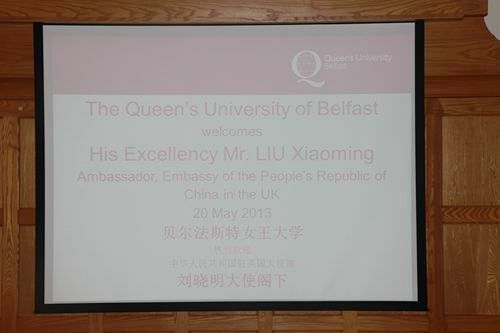 Ambassador Liu’s speech was like a gust of spring breeze blowing across the ancient campus of Queen’s University Belfast. They have reason to believe that the new type of relations between the two big countries of China and Britain with understanding, mutual trust, dialogue and cooperation at the core will finally usher in a beautiful spring.